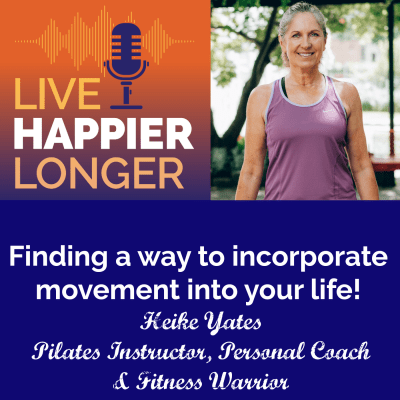 Heike Yates is a certified personal trainer, pilates instructor and fitness warrior. Almost 30 years ago, she left corporate America and never had a plan to pursue fitness as a career. When she moved to America from Germany, she realized that activity wasn’t readily available in the US as a part of everyday life. People spent more time in cars. Heike joined a YMCA dancercize class to lose weight after her first baby, became a teacher of that class and then a personal trainer. Had her 2nd baby and taught pre post-natal classes, yoga, pilates, spinning, etc. Heike wanted to know more about movement and what she could do which his what has helped her do many different things in life. If you’re injured or frozen in time, you can find a solution for your lack of movement. There’s always something we can do. If you sit all day move your legs and arms, it counts as exercise! You have to incorporate movement into your daily routine. Pursue Your Spark Podcast & Program is for women (and men) who want to be physically and mentally active. If you’ve never done exercise, start little. Stomp your feet, snap. What did you do when you were younger? What did you enjoy? Do that to start your Move journey. For more including the FREE downloads we talk about, please visit Heike at www.heikeyates.com!